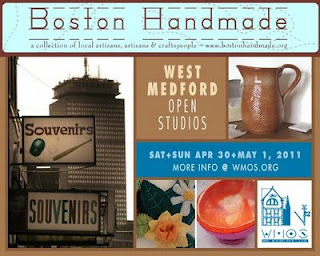 This weekend some of my Boston Handmade buddies are going to be showing/selling their lovely work during the West Medford Open Studios. It's taking place Saturday April 30 and Sunday May 1 from 12-5pm each day and they will be altogether at 56 Bower Street in Medford. Please go to wmos.org for more information and for a list of other participating artists. Good luck, ladies! yay thanks for spreading the word!